Group of Biomembrane Functions | Division of Biological Science, Graduate School of Science, Nagoya University. When you think about bacteria, what comes to mind? Some might say that bacteria are bad organisms that cause infectious diseases, whereas others may say that fermented soybeans (Natto) are made using bacteria. These are both true statements, but it is also true that bacteria are very useful in modern life science technology. Even though an individual bacterium is very small, each cell still contains the machinery to move by itself (motility) and sense environmental information (recognition). Bacteria have the ability to move toward better environments (taxis). Our research interests focus on energy transduction and sensory transduction in bacteria. 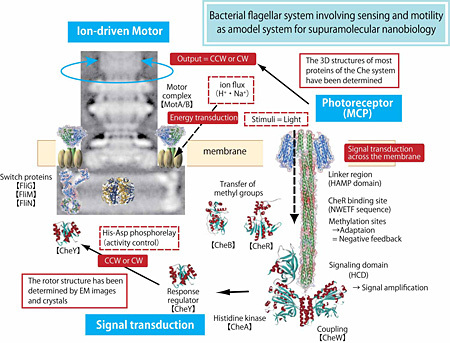 We place a special emphasis on the supramolecular complexes located in the cytoplasmic membrane, namely the flagellar motor and the photoreceptor-kinase complex. The bacterial flagellar motor is an elaborate molecular machine driven by proton- or sodium ion-motive force. We want to understand how electrochemical energy (i.e., ion flux) is converted to mechanical energy (i.e., torque) to drive this tiny rotary motor. The photoreceptor-kinase complex is a polymodal molecular sensor that regulates the flagellar motor in order to achieve taxis. We want to understand how a light signal is received and transmitted by a receptor in order to produce an intracellular signal, and how this signal is attenuated by a feedback regulatory system. Furthermore, we want to know how the shape and function of the biological membrane are regulated; to address this issue, we are using giant liposomes. Our group focuses on membrane functions, and studies them from a systems biology perspective by using structural biology, nanotechnology, molecular biology, molecular genetics, biophysics, and other methods as appropriate. The bacterial flagellum is a helical filament driven by a reversible rotary motor at its base. The energy source for the motor is an electrochemical proton or sodium ion gradient across the cytoplasmic membrane. The flagellar filament is a huge organelle, whose length is several times larger than the cell body. To make an analogy, this is as if a 160-cm tall person were to swing a 4-m string at 1,700 rpm, close to the speed of a Formula One car engine! This flagellar system is the only rotary locomotive organelle yet described. However, the mechanism underlying flagellar motor rotation has yet to be fully elucidated. Therefore, we are trying to clarify the energy coupling using the following approaches: (i) Transform proton-driven motors into sodium-driven motors by genetic manipulation; (ii) Precisely measure flagellar rotation using a tiny bead attached to the rotating filament; (iii) Investigate behavior of the stator proteins on the membrane, using GFP-fusion constructs; (iv) Determine the protein structure of the motor; and (v) Reconstitute the entire motor in a proteoliposome using purified motor components. With these projects, we hope to elucidate the rotation mechanism of this magnificent molecular machine. Sowa, Y., et al. (2014). Proc. Natl. Acad. Sci. USA. 111(9):3436-4341. Imai, K., et al. (2013). J. Bacteriol. 195: 4517-4526. Sakuma, M., et al. (2013). J. Biol. Chem. 288(24):17451-17459. Terashima, H., et al. (2013). Proc. Natl. Acad. Sci. USA 110(15):6133-6138. 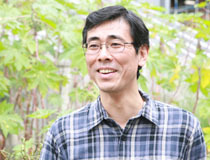 Kitaoka, M., et al. (2013). J. Bacteriol. 195(4):816-822. Shiwei, Zhu., et al. (2012). J. Bacteriol. 194(24):6728-6735. Kojima, S., et al. (2011). J. Mol. Biol. 414:62-74. Tajima, H., et al. (2011). J. Biol. Chem. 286(49):42200-42210. Li, N., et al. (2011). J Bacteriol. 193(15):3773-3784. Terashima, H., et al. (2010). J. Mol. Biol. 397(3): 689-696.